Your temporomandibular joint is one of the most complex joints in your body. It connects your jaw to your skull and is responsible for facilitating a wide range of important daily actions such as chewing, swallowing, speaking, laughing and yawning. Proper alignment of your jaw is necessary for this joint to function properly. When your jaw becomes misaligned, it can place stress on the temporomandibular joint, resulting in a variety of painful symptoms. This condition is referred to as temporomandibular joint disorder, commonly abbreviated as TMJ or TMD. Often, the pain associated with TMJ can impact other areas of your body such as your head, neck, shoulders, and back. This diversity of symptoms can make it difficult to diagnose the condition. 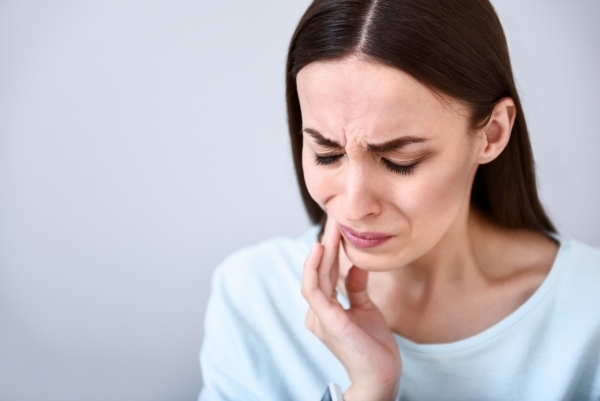 If you've been experiencing pain in these regions and have struggled to find relief with other treatments, you should visit Aesthetic Dental Studio for a TMJ diagnostic exam. Dr. Gordon Chee has been treating issues associated with TMJ for over 15 years. He can help you restore proper alignment to your bite in order to alleviate the painful symptoms you're experiencing. Please call 403-543-4600 today to schedule a TMJ evaluation at our Calgary dental office. Your combination of symptoms will vary based on the severity and type of your jaw misalignment. You don't need to experience all of the above-mentioned symptoms to have TMJ. 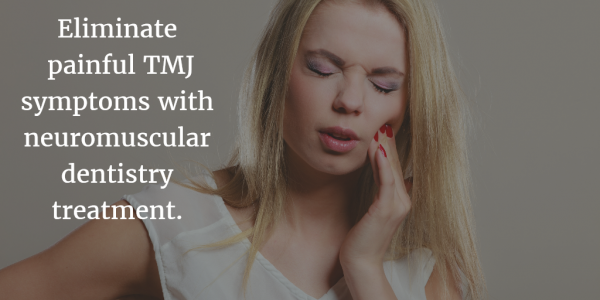 In addition to being continuously saddled with chronic pain, untreated TMJ can result in serious oral health issues. When your jaw isn't properly aligned, it can cause uneven tooth wear that will eventually require costly dental procedures to correct this issue. The alignment of your jaw can also impact your neck and back muscles. When jaw misalignment is left untreated, it can cause you to have sloped, hunched posture that negatively affects your bone strength and muscle tension. TMJ is diagnosed and treated using the principles of neuromuscular dentistry. This field of dentistry focuses on the joints and muscles associated with your jaw and bite. The goal of neuromuscular dentistry is to discover the ideal resting position for your jaw in order to restore a properly aligned bite. Transcutaneous Electrical Neural Stimulation (TENS) is a specialized therapy designed to treat the pain associated with TMD by directing mild electrical pulses to your facial and jaw muscles. These impulses increase blood flow to the region and help to relax the muscles, making it easier for Dr. Chee to determine the ideal jaw position for your bite. EMG allows Dr. Chee to measure the activity of your jaw muscles, both while moving and at rest. Using this information, he can locate the precise spot where your present bite is straining your jaw and neck muscles. This will help him determine the ideal position for a relaxed bite. Computer jaw scanning techniques allow Dr. Chee to follow the exact movement of your jaw while it performs routine tasks such as opening, closing, chewing and swallowing. Studying these movements will help him determine the ideal bite position to facilitate optimal jaw movement. ESG technology utilizes a device resembling a pair of headphones that rest comfortably against your jaw. This allows Dr. Chee to listen to your temporomandibular joint and compare the results with normal jaw performance. The ESG's tiny microphones can detect even the faintest joint sounds, which could be an early warning of jaw joint disease. After Dr. Chee has arrived at the cause of your condition and determined the ideal resting position for your jaw, he'll create a customized TMJ treatment plan to restore a properly aligned bite and alleviate your painful symptoms. Once your pain has been significantly reduced, you'll move into the second phase of your TMJ treatment. During this stage, Dr. Chee will help you restore a properly aligned bite. This will provide a long term solution that will prevent your TMJ pain from recurring. Neuromuscular orthotic device - This device is custom crafted to ensure proper fit, and it will help ensure your jaw remains in its ideal resting position. Customized mouth guards - These devices can be worn at night to prevent you from putting strain on your teeth, joints and muscles while you sleep. Individuals who grind their teeth while they sleep may be a candidate for this treatment. Restorative dental treatments - A variety of restorative dental treatments can be performed to reposition your bite to its proper alignment. Orthodontic treatments - Orthodontics can often be an effective way to restore proper bite alignment. Full mouth reconstruction - In cases of serious misalignment, Dr. Chee may recommend full mouth reconstruction for optimal results. If you suffer from chronic migraines and have been unable to find relief with other treatments, it's likely that your headaches may be caused by TMJ. The reason is the temporomandibular joint, the busiest and most powerful joint in your body, is situated in a nexus of muscles, nerves, and blood vessels that feed your head. Problems in this joint may be causing those headaches you cannot seem to shake, even if you do not suffer from any other obvious symptoms. 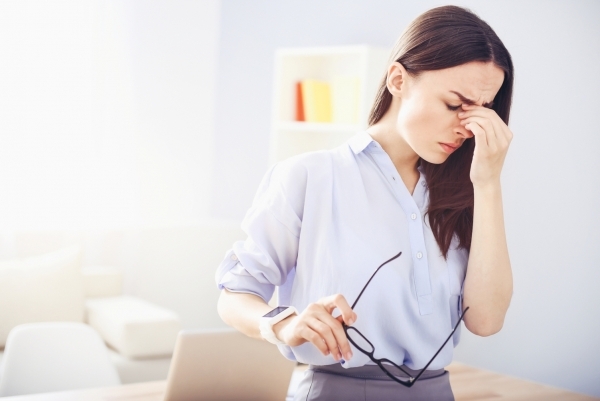 There are many different classifications of headaches: migraines, cluster headaches and tension headaches are some of the most common. It is nearly impossible to tell exactly what causes the majority of headaches, but many people suffer headaches from stress or inflammation of the temporomandibular joint. Dr. Chee can use neuromuscular dentistry techniques to restore your jaw to a more relaxed position. This can alleviate the strain on the surrounding muscles and joints which commonly cause chronic headaches. Ultimately, this course of action can help alleviate these headaches once and for all. Dr. Chee has undergone extensive neuromuscular dentistry training and has more than 15 years of experience in treating TMD. This knowledge and skill can mean the difference between months more of pain or treatment leading to a pain-free life. In addition to this neuromuscular dentistry experience, Dr.Chee utilizes the latest and most advanced technology available for the treatment of TMJ. This will ensure that the optimal resting position for your joint is determined with the precision necessary to deliver the relief you need. Dr. Chee also strives to create an environment that will make you feel comfortable talking openly and honestly about your condition and the pain you're experiencing. He'll listen carefully to what you have to say and answer all of your questions to ensure you're fully comfortable with his treatment recommendations before moving forward. Please contact Aesthetic Dental Studio using the form on this page or call 403-543-4600 today to schedule a TMJ consultation. We serve patients in Calgary, Cochrane, Airdrie and the surrounding areas of Alberta.